When walking the desert in the summer time heat one finds there is a stillness on the land. The stark blue sky without any clouds is motionless, and all the animals or deep in their burrows or hiding in what little shade they can find. In contrast to this, the night offers cooler temperatures and the moon and the stars give motion and beauty to the night sky, and the desert comes to life in the darkness of the night. It is here in the darkness that the drama of predator and prey is played out. In this scene the ram which is primarily at daylight creature is not only willing to come to the spring to drink his fill of water at night. He is also willing to run the bobcat off that has been following him for days. This would’ve been a very different story with a mountain lion. Now having run the bobcat off, the ram can drink his water in peace. And here we see this big ram has the confidence to turn his back on that pesky bobcat. Now having run the bobcat off and gotten a good drink of water, are ram walks back out into the vast darkness of the desert. 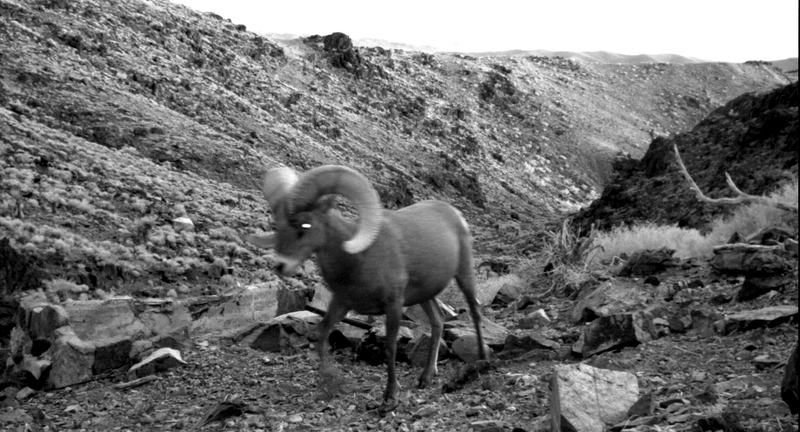 This camera has recorded this ram and bobcat going through a similar routine three or four times at this spring. I don’t think that this bobcat was seriously hunting this ram. I think this bobcat was using this ram’s presence as a distraction. That is to say the other animals would be aware of the ram and not the stealthy bobcat. For some animals this could be a deadly mistake. 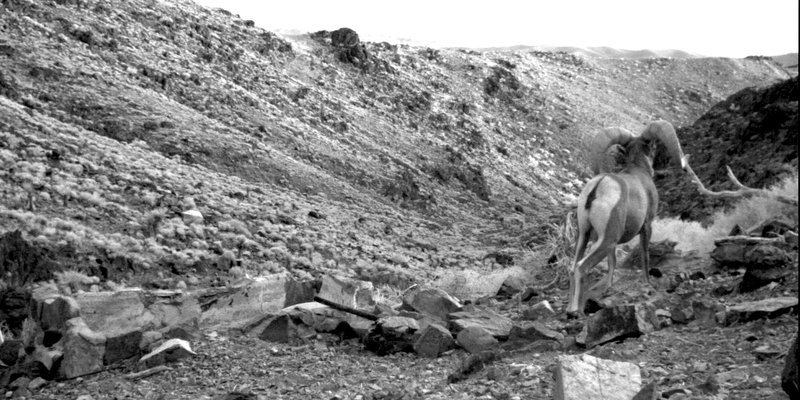 Only a few large rams were willing to use this spring at night all the rest of the desert bighorn sheep came during the daylight hours. 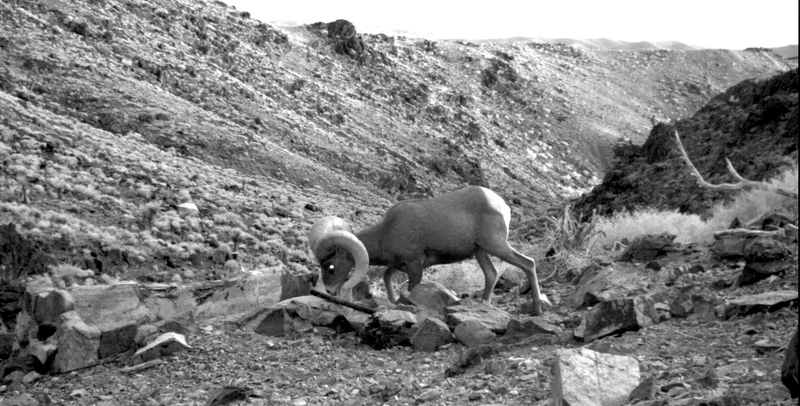 These photos are part of the Society for the Conservation of Bighorn Sheep photo survey which now has approximately a half-million photos in it archive. Carlos Gallinger and Tim Liddell discuss desert survival tips and how to deal with cold desert nights. This lecture discusses the importance of learning the desert at night. Half of all activity that occurs in the desert environment happens at night. To truly understand what is happening during the daytime, one must also understand the night. Water pockets in the desert can be a significant place to learn about wildlife. This lecture will help you to better understand what water pockets are, as well as identify which ones are important and which ones are not. In this book the reader will find that every trip into the wilderness can be made into a lesson on tracking and reading sign; and once somebody has learned to do some tracking, it opens up a whole new world to them. This book seems to have as accurate a title as a book ever could. When I first read this book, I thought I was pretty good at tracking, but after reading this I began to use the book's lesson plan to learn a lot more.